In this post I continue my progress towards an DDD version of my favorite pet project. In this iteration I add a way to check the budget against the real expenses. The code is on GitHub and the picture contains the new model. In my previous blog post I started to apply Domain-Driven Design to my favorite learning project. The quick summary of that post is that I started to create a Ubiquitous language and designed two aggregates. To achieve financial insight the application needs to import and categorize financial transactions. I want to set budgets for a year and compare them to the actual amounts. In order to check if my expenditures are still on budget I like to execute a method on Budget like budget.remaining(). To easiest way to calclulate the budget.remaining() is to substract the amount used for a budget from the amount planned. Add the category repository to the budget aggregate. Make an application service to coordinate. Make a domain service that calls the repository from the budget. Using eventual consistency in combination with domain events. I can add the category repository to Budget, however this seems mixing responsibilities. Of course it will work. If I look at the internet this seems bad practice. It is also possible to rethink my original design of aggregates. I could make budget the aggregate root that includes category and thus the transactions. This would make it easy to calculate the budget remaining. However Budget and Category have a different life cycle. A Budget is bound to a specific year while a Category typically will live for many years. Therefore this option is not the right one. I can create an application service that will coordinate the change and let it update both the category and the budget. In my opinion that sounds too much like procedural coding and is not a viable option. Another option is using a domain service that indirectly calls the repository. Linking the domain service in the entity is allowed. Although this seems actually not really different from including the repository, just another indirection. Therefore not an option for me. The final option is raising an event every time a transaction is added. A separate event listener can then update the budget. This way I realize separation of concerns. The downside: some “infrastructure” is needed before it actually works. This is for me the cleanest option and thus the way forward. However in this option there are some extra things to think about. A category spans multiple years and a budget is specific for a single year. So the question is which budget needs updating. There are several options for solving this. Loop through all yearly budgets for a specific category and update all budgets based on the new amount. Make the event specific for a year. For now I have chosen for the option to loop through budgets for a specific category. Mainly because this is easiest to implement. Otherwise I need to compose a complex event that is targeted to update budgets including at least the transaction year or worse the whole transaction. That feels like mixing the aggregates a bit. Next to that by making the event more generic it is easier to reuse later if that is needed. By choosing this approach the consequence is that performance will take a hit. Currently only the field amount is stored in budget. So now I need to change amount into amountPlanned and introduce amountUsed. Furthermore I need to create an AmountUsedUpdater that acts as an event listener to update the amountUsed. I didn’t use amountSpent because I have also some budgets for my income. In this blog post I show the way I implement the comparison between the budget and the actual expenditures. The code is on GitHub. The picture below shows the domain model. In this post I apply Domain-Driven Design to my favorite pet project. The picture above contains the resulting model. The resulting code can be found at GitHub. As mentioned in my previous post I need to learn Domain-Driven Design for my new job. In this post I apply the things I learned till now to an application that gives me insight in my financial situation. The domain is very familiar to me as I used it before to learn new things. The application mainly tells me where I spent my money. Next to that I set yearly budgets on each category in the beginning of a year. During that year I will compare the budget against the actual situation to assess if I’m still on track. Ideally the application also incorporates some functionality to calculate my savings rate and some other metrics related to reaching financial independence. Eric Evans’ book emphasizes the importance of the ubiquitous language. So let me try to define the ubiquitous language for this application. To achieve financial insight the application needs to import and categorize financial transactions. I want to set budgets for a year and compare them to the actual amounts. Furthermore based on the actual numbers the savings rate and years till financial independence must be calculated. In order to calculate the years till financial independence there is something to assess my savings and investments. The application will not help in getting more income. Getting insight in your expenses can help to see when budgets are exceeded and where expenses are high. So for now I first focus on categorizing financial transactions and creating budgets. Please note that for my personal finances I don’t use double bookkeeping as it seems overkill. Next to that I ignore any cash transactions. Not categorizing cash transactions will not influence my insights much as I don’t use a lot of cash. Next to that keeping all receipts is too much of a burden to me. After defining the ubiquitous language the next step in Domain-Driven Design is to try to make the model. Important parts of the model are the entities and value objects. As the focus is on categorizing and budgeting I find at least 3 objects of interest: Category, Transaction and Budget. To me a Category is an entity. Mainly because in time the amount of money spent in a Category will change via adding new transactions. Furthermore there must be a Budget more specifically a Budget per Category per year. Budgets are entities as pretty much anything can change in time. If I look at Transaction I’m a bit in doubt. During the life cycle of my financial administration a transaction will not change. That is because they are originating in an external source: my bank. Next to that I’m only concerned about the values of a Transaction. If I need to make a guess I think I need an account number, a contra account, the date, the amount and the description of the Transaction. These fields are also the important ones in my naive Bayesian classifier to categorize my transactions. For now I make a choice to make a Transaction a value object. This might be revisited later. For Category the name is a good identity. There is a unidirectional association from category to zero or more Transactions. Next to that there is a unidirectional association between a Budget and a Category. Because setting a Budget without being able to categorize real Transactions doesn’t make sense, it is not possible to have a Budget without a corresponding Category. Over the years there are many Budgets per Category, however per year there can be only 1. This means that for the identity of the Budget it is probably wise to include the year. To me combining the Category and a year seems a good choice as identity for the Budget. Time to define some aggregates in the model. Typically a Budget is created at the beginning of each year and Categories are created once (and maybe adjusted once in a while). However during the year I import and categorize my Transactions. For me this leads to a logical split. Making Budget an aggregate with only one entity. Category and Transactions are an aggregate as well. Category is the aggregate root. As Budget is a separate aggregate root I don’t want to include the Category as an object. I just want to have a reference to a Category through its identity. This has implications for the Budget and its identity. It identity is now made of a Category name and a year. Time to choose the repositories. My first attempt is a repository per aggregate. Given the requirements this makes sense to me now. In the future I probably want to persist my data somehow. Maybe with a relational database, maybe an object database or maybe just plain old CSV files. For exploring and building the domain this is not relevant. Furthermore maybe some future feature(s) will give me more information what storage technology will suit my needs. 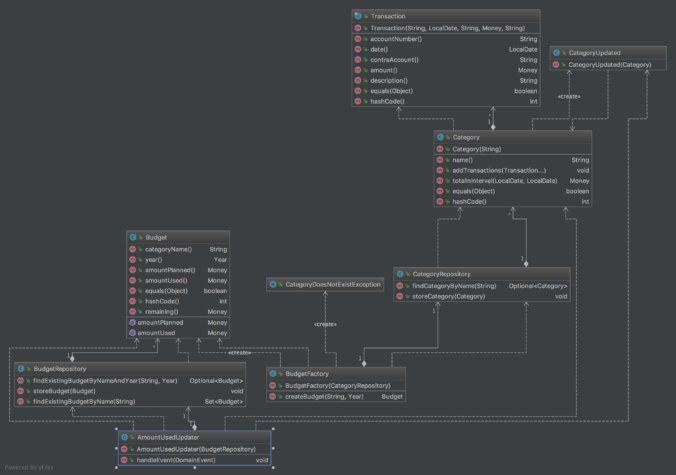 For now I will just use an plain old java implementation of my repository, using the collection classes. Creating a category is straight forward as there are no special requirements here. So a constructor will suffice. However for creating a Budget we need to make sure that there actually is a Category available. To check if a Category exists I need to find the Category by name using the CategoryRepository. I could make an association in Budget to that repository. However that seems bad practice. I think creating a BudgetFactory makes sense in this case. Given the small number of objects in the domain now I don’t find it necessary to split these classes among different modules yet. 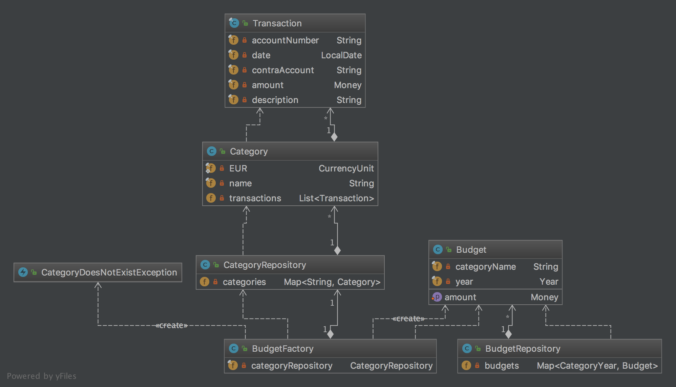 The model created seems to cover my basic needs of storing the budgets and categorize transactions. The complete design is shown below. Next to that the resulting code, including unit tests, can be found on GitHub. However I didn’t implement comparing budgets to actual expenditures yet. Next to that I only implemented the model so at this moment there is no application to run. These are topics for another blog post. On my new job the department is applying Domain-Driven Design. 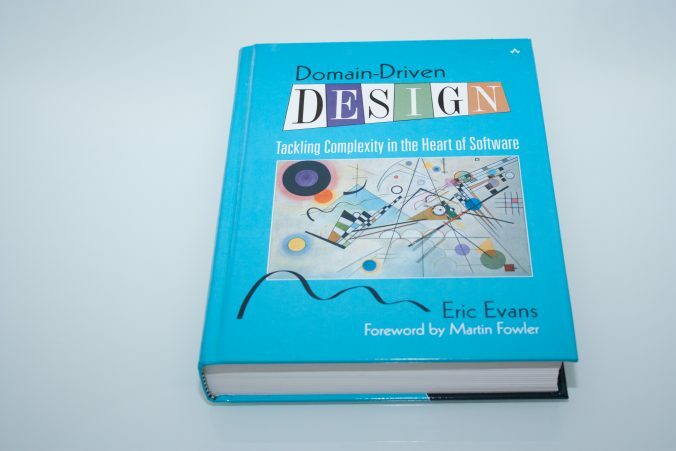 I did read Domain-Driven Design – Tackling Complexity in the Heart of Software by Eric Evans a couple of years back. However as I never used it I need to learn how to apply it. So in order to really learn DDD I started to reread Eric Evans’ book and plan on reading Implementing Domain-Driven Design by Vaughn Vernon. As theory and practice are only equal in theory, I want to apply DDD to my favorite pet project. To recap an earlier blog post, many years ago I started categorizing all my financial transactions. At first I used to build a tool myself to give me insight in my spendings, later I bought something to do this for me. However this is now the domain I know pretty well and use to learn new things. My plan is to finish reading both books before the end of the year. (I hope I can find the time, given that I have a young daugther.) In the same time I plan to work on my pet project. As I learned long ago a good way to learn things is to teach others. So I want to share my progress in implementing DDD on my pet project through this blog. So the coming weeks expect some new blog posts on this topic. Basically me struggling to apply the DDD concepts.